The last few years, he’d found his work disagreeable. The routine, the violence, the lack of internal recognition, the citizens’ scorn. You had to put up with all that, and for what? When he’d enlisted in the police force, he’d imagined he’d be a kind of physician for a sick society. It took him a while to understand that he was no more than a minor nurse doomed to dress suppurating wounds with outdated ointments. Criminality would never stop, it couldn’t stop, it was part of human nature. The most you could hope to do was bring down the fever a little. But no one had yet invented a reliable thermometer. A heavy melancholy was numbing his body and his mind. For each investigation, how many lives were broken, how many bodies lay in the cemetery, and how many souls were locked up behind four damp walls in a prison? And how many wounded hears were there among the survivors? If those passages don’t resonate with you on some level then this book probably isn’t for you. But if they do…if they make you want to learn more about the man pondering those thoughts and the world in which he lives then I highly recommend AUTUMN ALL THE CATS RETURN. It is the follow up to the delightful SUMMERTIME, ALL THE CATS ARE BORED and it shares something of the first book’s sensibilities. Its setting, a small-ish town in southern France, is vividly brought to life and is a far cry from the gritty urban streets beloved by so many crime writers. But this book is darker than its predecessor, perhaps because it doesn’t take place at the height of summer? If there is a winter book will it be even more grim? The case at its centre manages to be fascinating despite the fact there isn’t a huge amount of suspense associated with it. An elderly man is killed in his apartment and the letters scrawled on one of his walls suggest to police that the murder might have something to do with the Algerian War of Independence in which, during the 1950’s and early 60’s, Algeria gained its independence from France after an often bloody conflict. Gilles Sebag and his colleagues must investigate within the community of ex-pat French Algerians, known as the Pieds-noirs, many of whom are still grieving the loss associated with being forced from the country of their birth. I’ll admit upfront my level of knowledge of this particular war and its aftermath prior to reading this book was hovering at zero but even so I felt the depictions were credible. Like displaced peoples the world over, some come to terms with their new circumstances while others allow their resentments to flourish and we meet a range of these characters as the story unfolds. Via some well-placed flashbacks we also gain a small insight into the events of the war and a particular group of underground guerrilla fighters. The book is a long one at 430 pages but, rarely for me, I didn’t find myself wishing someone had taken to it with a red pen. I enjoyed the depictions of the sometimes dull but always necessary police work, not all of which pans out of course. These are interspersed with snippets from Sebag’s home life which is basically sound, despite the fact he believes his wife has recently had an affair and he wrestles internally over whether or not to have her confirm it. At the beginning of the novel a friend of his teenage daughter is killed in an accident and I thought the way in which she asks her father, ‘the hero’, to look into the case very touching. Matched by his desire to live up to his daughter’s expectations of him. Although he is in many ways not a traditional crime fiction protagonist I find myself feeling quite affectionately towards Gilles Sebag and I have truly enjoyed immersing myself in this latest, languid adventure. If you like your crime fiction a little out of the ordinary I really do recommend this one and think you could easily pick it up without having read the first novel of the series (though I bet you’ll want to afterwards if you don’t do it beforehand). This entry was posted in book review, France, Philippe Georget. Bookmark the permalink. 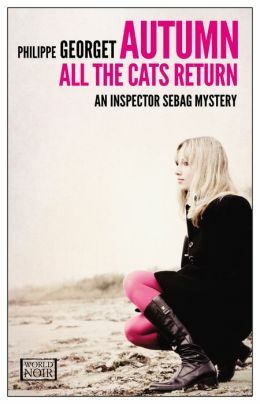 I think the cover is an improvement on ‘Summertime, All the Cats are Bored’, but then, it would have to be 🙂 Thanks for the review; I liked Gilles Sebag enough to try his second outing. You make a really interesting observation, Bernadette! I wonder if season has something to do with how noir a novel is. I’ll have to think about that one. In the meantime, I’m glad you enjoyed this one, and I like Sebang’s character too. Sounds spiffy. I’ve ordered SUMMERTIME, ALL THE CATS ARE BORED from the library. Hope you enjoy it. I do love the way we can order from our wonderful libraries these days when we hear of a book we might enjoy. I liked Summertime… and am quite pleased that a second one is now available. The darker the better usually for me – but, as you say, probaby still a far way from noir! It is a good read. I like Gilles. I got tired of the issue with his wife, however. That’s gone on way too long… (his wondering). Either figure it out or move on. I hated the cover too. Agree it’s not grim when compared to most crime fiction Amy…I just thought it was less lighthearted than Summertime….but maybe I’m mis-remembering the first book. Agree that he needs to stop blathering on about whether Claire did or didn’t. I do like the sound of this one, I’m quite fond of the boring police details and not just those that are successful, I also like a good ‘home-life’ story. Great review!